I get it Rainbow Boy is Rainbow Bright’s Father!!! All kidding aside, if you have a character who’s side kick is named RAINBOW BOY do NOT… I repeat DO NOT!!! give him pink underwear he wears outside of his spandex! 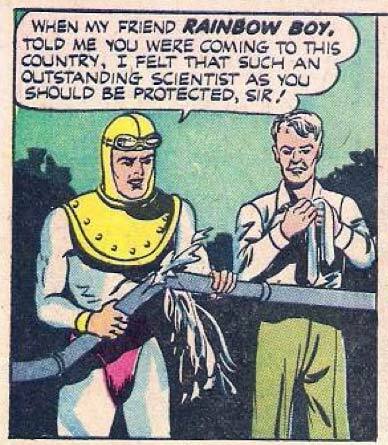 This guy was probably made fun of by all the other golden age superheros for that outfit! Why does he have the neck piece of a diving hemit and what looks like a cloth hood, and flight goggles. I think they took all the costume ideas that were rejected from all the other heroes and put them on this guy. You can tell they never took this guy seriously, he doesn’t even have an ensignia. The water comming out of the pipe looks more like they tried to cover up a white out spill, And that poor old guy with the baggy old man pants! God, and they call THIS the golden age of comics!?!? I think even Mole man, or The Spot could take this guy out! So we’ve got Rainbow Boy and, what, Fluffy Unicorn Man?